This is a really niche post, but I had a good experience last week running and wanted to share. First, I have never been a fast runner. Generally I can get into a steady pace, though, and keep turning miles. Even when I was much younger, at 40 (about 15 years ago) I tended to run half-marathons (13.1 miles) in about 11 minutes per mile (which for the uninitiated is slllooowww). Since that time, as I have aged and I have developed mild arthritis in my knees, my times have suffered. I was always too snooty to try run walk run. Even if I was slow, I took pride in just being able to keep running for 2-1/2 (or 5 for a marathon) hours continuously. However, I noticed a while back that even a brief stop, say walking through a water station in a race, really provided a lot of recovery to my sore joints. So for the last 2 months I have been training with run-walk-run. After some experimentation, I created a pattern of 2:40 running followed by 1:00 walking. I don't have to stare at a clock, I have an app (there are zillions of them) on my phone that once programmed with the time just tells me in my ear over my music when to start running and when to start walking. At first, I did not expect a lot of improvement, probably because I didn't understand how jogging along and then walking could be faster. But the point is that even a one minute walk is very refreshing and I tend to burst out of each walk with new energy and run the next section much faster than my usual jogging pace. The theory is then that -- for running pace R > jogging pace J > Walking pace W -- R+W combined will be faster than all J. And this certainly turned out to be the case for me. 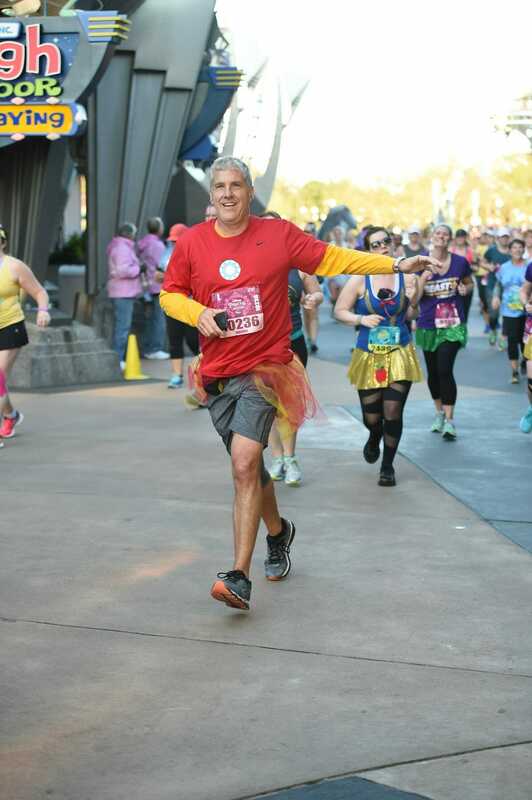 Last weekend I ran in the Disney Princess Half Marathon (this is my favorite race and my daughter and I started running it years ago) and finished at a pace just a hair behind where I was 15 years ago, a full 2 minutes per mile faster than I was running before doing run-walk-run. The one downside is that this can be tremendously irritating to other runners, particularly on a crowded course. Races group people into start corrals by time, so that everyone in a certain part of the racecourse should theoretically be running about the same pace and not bumping into each other. Run-walk-run folks screw this up. But at this point, so many people are doing run-walk-run that I no longer feel a lot of guilt. By the way, we generally run the Disney races in costume, so I used my Ironman running costume I did for the Marvel race and added a fetching matching tutu. Here I am running through the Magic Kingdom. The tutu is a little worse for wear by mile 6. Thank you for writing this -- and -- welcome to my world! I discovered run-walk-run in 2010, several decades after having to give up running because of knee pain that would not go away. Long story short, I'm back to doing something -- running -- that I didn't think I'd ever do again. It's been tremendous fun and I'll enjoy it as long as I can. I see to remember from my Boy Scout days, late 50s, that lope - walk - lope was called running like a wolf. Nothing new under the sun, sorry. My uncles 1932 Boy Scout handbook had the same thing. I believe it counted paces so 50 running paces, 20 walking etc. or something like that. I don't think it specifically deals with cardio but allows muscles and tendons to recover. I have been reading your blog for years now, but this is the first time I knew what you look like! Yours is one of the few blogs where I read every post. I developed arthritis in one of me knees a few years ago, I couldn't even kneel let alone run. (Not surprising after 20 years in the Army running in boots and carrying extra weights). My doctor recommended full strength Glucosamine Sulphate tablets, she said they don't work for everyone but I gave them a try. Its not a miracle cure but after 3 months I was just about pain free and now run 5 miles 3 or times per week and play golf twice a week. I limit it to 5 miles because every time I try for more I get other injuries. Thanks for the tip on run/walk/run I might give it a go as I would like to do another half marathon and I'll see if it helps with injuries..
We did the 5K for the first time this year with my daughter based on your previous posts. It was a great experience and we wanted to thank you for sharing this sort of thing! I use run-walk-run for my workouts, and find that I get some real benefit. The cardio recovery of walking allows me to work out longer without overtaxing my heart and lungs. Very beneficial for us older guys. R/W/R is all I do these days, by and large. I like the mental aspect of it, as it's a series of smaller, more easily attained goals. My frame was made for hauling gear all day at walking speeds, not the incessant pounding of running, so r/w/r is far friendlier to my very non-Kenyan (that is, not lithe and graceful) body! I'm only a 5k guy, but one of my cycle of workouts is 3min run, 1min walk. When I find myself covering more ground on this than in the steady run, it's my signal to increase the pace of the steady run. In case anyone cares, the cycle generally goes 3.8 mi. steady run, 8x3/1 intervals, 8xMEI (maximum effort intervals - 30 second sprint/1:30 recovery), 4 mi. steady run, rest day. In the past year I've gone from a roughly 32 minute 5k to around 25. I'm about your age and have had similar problems with my knees during my weekly full-court basketball game. I dropped 10 lbs and found it made an enormous difference. Completely pain free. I took up cycling a few years ago because running was so hard on my knees, I had hoped to ride a century (100 miles in a day) last year but never quite got around to making an attempt, though I did get up to almost 80 miles. A century is definitely on my list for this year.